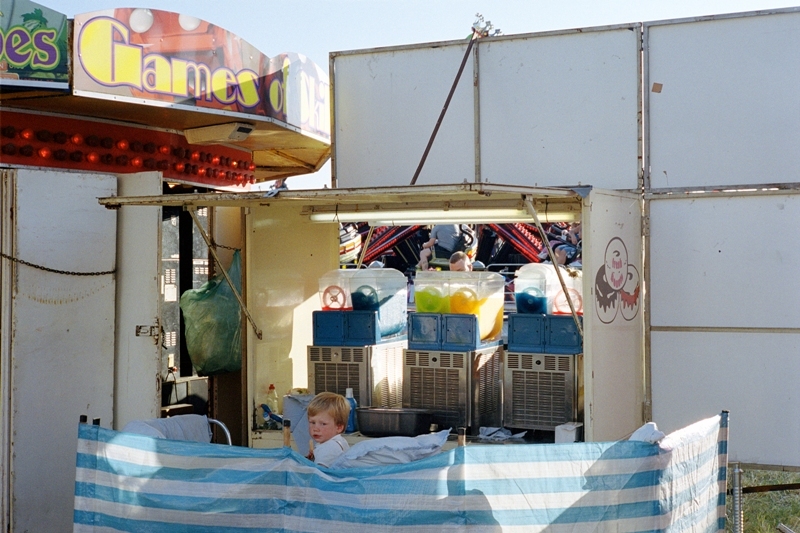 Photographer Daniel Dale talks us through his inspirations photo exhibition by himself and Murray Thompson and their project on the Hoppings Fair. For my inspiration I guess I could describe the first exhibition I saw when I was in my first year of college at the Side Gallery. Or there’s the first photo book, which I won a competition for from MACK books back in 2013. Or there’s the countless photographers I found along the way that either challenged my view of the world or the object of the photograph itself. In a way there is a lot of influences to look at and choose from over the years, each time they shape differently, kicking me in the face numerous times or falling by the wayside to gather dust. However, the one I will always remember, and will always return to, is an afterword from William Eggleston in his book ‘The Democratic Forest’. Eggleston saw the potential in everything to be a photograph, the world was present to him as an even canvas in which he had an immense freedom to point his camera. As a photographer I believe you sit on a pedestal and give yourself up to judge the importance of what surrounds you, the importance of what deserves to be a photograph or what will make a ‘good’ one. Eggleston taught me that although we can sit and judge, there should be nothing that is not worth attention. Last year (2017) me and Murray Thompson decided to collaborate on a short term project, at the time The Hoppings was only a couple of weeks away so we decided it as a subject on a whim. The Hoppings is possibly the most photographed event in Newcastle, it has become a backdrop for photographers and the subject for photographers each year. When me and Murray started Temperance we decided we’d visit the Town Moor at all times of day whilst The Hoppings was here. I realised that I was confronted with the opposite of what I’d learnt from Eggleston, that everything had already been given the status of a worthy photo. In reality it seems crazy for someone to go to The Hoppings and not take a photo or video of their time there. I almost felt a need of defiance to not do the project and sit photographing grass, dirt, and maybe a bit of asphalt instead, It would have been true to the spirit of Eggleston. As we started out we quickly got on to a discussion about the overwhelming clash of time and culture, comparisons that lined up beside each other and showed us the fairs age and audience by era. An amazing display of airbrushed celebrities that have fallen from our TV screens or settled onto an afternoon re-run slot, cosied up beside the new Disney stars and characters that are stuffed into arcade claw games or hung up for a lucky ‘winner every time’. We talked about how the rides have evolved but with traces of the past still lingering, a sense of traditionalism and acceptance in the helter-skelter sharing turf with a ride you spend most of your time upside-down on. Eggleston’s idea to view ‘nothing’ as the potential for ‘something’ was still there, but I couldn’t ignore that everyone sees The Hoppings as a photographic potential already. it is already ‘something’, and the interest in the project wasn’t in what could be made out of nothing, but was to see what was so worthy that it is photographed year in year out. It became, in itself, a truly inspiring subject that wasn’t just The Hoppings of 2017 but also the Temperance festival of 1882.